Based on a total of 14 inclusions from Burmese amber the new, extinct insect order Tarachoptera was established. The new order Tarachoptera is placed in the superorder Amphiesmenoptera. The species of Tarachoptera are tiny insects with a wing span of 2.3–4.5 mm, but are highly specialized according to their aberrant morphology. They lived in the forests of Southeast Asia about 100 million years ago. In this study, the well-preserved skull of a giant amphibian from the Late Triassic Stuttgart Formation (Schilfsandstein) of Bielefeld-Sieker in NW Germany is described and a new species, Cyclotosaurus buechneri sp. nov., is erected. Cyclotosaurus buechneri represents the only unequivocal evidence of Cyclotosaurus in northern Germany. The amphibian skull was found more than 40 years ago and is well known in Bielefeld and the surrounding areas but has so far never been described. The Devonian reef limestone complex of Rösenbeck near Brilon (Rhenish Mountains) shows numerous neptunian dykes and other hollows which have been filled with Carboniferous siliciclastic as well as fossil-rich carbonate sediments with ammonoids, conodonts, and chondrichthyan fish. These carbonates represent erratic blocks of sediments which were deposited in elevated areas but subsequently eroded and transported as erratic blocks into the karstic cavities. An overlooked taxon of Late Permian dicynodont, Digalodon, is redescribed. Based on new specimens, we recognize Digalodon as a valid taxon that fills an important gap in the record of latest Permian small-bodied herbivores. We review the fossil history of pseudoscorpions (Arachnida: Pseudoscorpiones), one of the oldest terrestrial lineages with a fossil record that goes back to the Devonian. Pseudoscorpions do not fossilise easily, and records from the Mesozoic and Cenozoic consist almost exclusively of amber inclusions. Overall, 16 of the 26 recent families have been documented from fossils. This is a group of evolutionary stasis and we discuss aspects of palaeobiology, preservation, and ecology. We report the first occurrence of an American lion from the late Pleistocene (≈120 000 years ago) of southeastern Hidalgo, central Mexico. The fossil material includes a lower canine tooth and a manus bone. Some areas of central Mexico were suitable hunting sites for the American lion, considering the high diversity of large mammalian herbivores that have been recorded there. The Mexican record of felids represents an important part of the Pleistocene North American diversity. A new lower actinopterygian fossil fish genus and species is described from a Paleozoic site in Canada. The new taxon, based on the study of a well-preserved fossil, is defined by a unique combination of characters including features of the scales and the bones of the snout. A review of previously described fishes from this locality highlights how redescriptions of large cosmopolitan genera, and descriptions of new taxa, are vital to our understanding of the diversity of this group as a whole. Complete morphological descriptions of exceptionally beautifully preserved Late Jurassic fishes from Bavaria (e.g., Ettling and Eichsttät), southern Germany, are provided for a new genus and species, which is endemic of Ettling and for a new family, Ascalaboidae. The new family is only known from marine Upper Jurassic localities of Europe and is interpreted as an extinct and primitive group of Teleostei, which is considered the largest group within osteichthyans (bony fishes). Plesiosaurians retain a very long neck but greatly reduce neck flexibility, and the cervicals have large, paired, and highly symmetrical foramina on the ventral side of the centrum, traditionally termed subcentral foramina , and on the floor of the neural canal. We found that these dorsal and the ventral foramina are connected by a canal. The foramen are not for nutrient transfer; they are the osteological correlates of a highly paedomorphic vascular system in the neck of plesiosaurs. This work is based on scales of a new group of Cretaceous South American fishes. Detail studies about scales are very useful, considering that many fossil fishes are known because of their squamation. Comparisons with other Mesozoic fishes were made. Among main conclusions are that these fishes present lepisosteoid-type scales (with enamel but without dentine) and in particular paired dorsal scales in the position where other fishes commonly have median dorsal ridge scales. Phreatophasma is a mysterious species from the middle Permian of Russia. Since its description in 1954, it has been assigned to many different groups: therapsids (the most diverse of middle Permian terrestrial vertebrates), caseids (one of the earliest herbivore lineages), and seymouriamorphs (a Permian amphibian clade). Using recent knowledge of morphology and state-of-the art analyses, we confirm that Phreatophasma is one of the youngest members of Caseidae, the second member to enter Russia. Based on the estimation of its body mass and metabolic rate, we calculated heat balance, gas exchange, osmoregulation, and digestion of the 290-million-year-old aquatic amphibian Archegosaurus. Our results suggest that its physiology was more fish- than tetrapod-like in many respects. We conducted this study, which is mainly based on theoretical calculations and comparison with extant analogs, to shed light on the physiology and lifestyle of early tetrapods. Extant pygmy and dwarf sperm whales (Kogia spp.) are known as small-sized and enigmatic relatives of the great sperm whale Physeter. Here we describe Koristocetus pescei, a new fossil kogiid from the late Miocene (ca 7 million years ago) of Peru. The description of this new form evokes a long history of morphological and ecological diversity in fossil kogiids, thus suggesting that our comprehension of the evolutionary history of diminutive sperm whales is still far from being exhaustive. The ongoing technical revolution in non-destructive 3-D visualisation via micro-computed tomography (micro-CT) finds a valuable application in the studies of bioerosion trace fossils, since their three-dimensional architecture lies hidden within hard substrates. Selected examples of such cases are illustrated by reference to bioerosion trace fossils preserved in Late Cretaceous belemnite guards from the European Chalk Province, including the description of two new trace fossil ichnospecies. The cephalopods Sepia (cuttlefish) from recent seas are well known, but what is their evolutionary history, when did they originate and how did they spread within the oceans? Based on a new sepiid record from Australia, we now recognize periods of sepiid migration, their evolution and distribution in time and space. We review shell bone microstructures of Adocidae and Nanhsiungchelyidae, two groups of extinct hide-necked turtles related to modern soft-shelled turtles (Trionychidae) and the pig-nosed turtle Carettochelys insculpta (Carettochelyidae). Adocids and nanhsiungchelyids both have a good fossil record in North America and Asia during the Cretaceous and Cenozoic. Our microstructural data supplement previously reported differences in external shell morphology between adocids and nanhsiungchelyids. 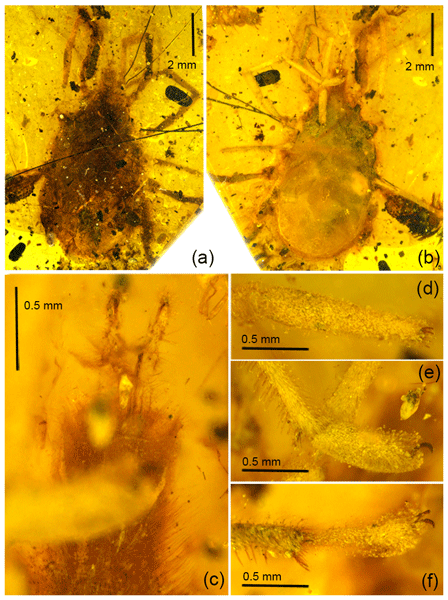 A new species of fossil mite, Immensmaris chewbaccei, is described from the 100 million-year-old (Cretcaeous) Burmese amber of Myanmar. It belongs to the modern family Smarididae and is of particular note for its enormous size, with a body length of about a centimetre. This makes it the largest example of an erythraeoid mite (the wider group to which it belongs), and in general it is one of the biggest mites ever to be recorded. Due to the fact that knowledge of Mesozoic fish faunas of the Southern Hemisphere is still inadequate and the diversity and evolution of the Late Jurassic marine fishes of Argentina remain unclear, I study a fish recovered from the Upper Jurassic sediments of southwestern Argentina. The fish anatomy was studied comparatively with other related forms. As result, a new taxon was created. The new taxon implies a broader knowledge of the ichthyofaunas of Gondwana. Amber functions as a window into the past, capable of capturing behaviors frozen for millions of years. Here, we report on the exceptionally rare discovery of a dinosaur-age larva of a stinging wasp, feeding on its cricket host, in mid-Cretaceous amber from Myanmar. It reveals a considerable constancy in the biology of this particular family over the last 100 million years. The excellent preservation of the larva is remarkable and due solely to the fidelity permitted by inclusion in amber. In this contribution we carried out a taxonomic revision of all Hermann Karsten’s vertebrate specimens from Colombia and Venezuela, which were collected during the mid-19th century; these fossils were never illustrated or subjected to detailed taxonomic study. The assemblage includes 60 cranial and postcranial remains attributed to “ground sloths”, “large glyptodonts (close relatives of armadillos)”, “South American native ungulates”, proboscideans and other indeterminate mammalian remains. Mesosaurs were reptiles that lived around 280 mya. They were the first land reptile group to return to the water. Study of a fossil from the Museum für Naturkunde, Berlin reveals a previously unobserved baby skeleton near the adult. This small skeleton can tell us about how these creatures grew; the lower segment of the hind limb is already proportionally larger than the upper hind limb and the lower and upper forelimbs. This may be because young mesosaurs needed to swim right from birth. This paper presents a description of an extremely well-preserved and articulated skeleton of a temnospondyl amphibian from the early Permian of Oklahoma. Postcranial material is not often well-preserved or well-described in the literature for this group, known as dissorophids, and acquiring new data on this region of the skeleton is important for understanding the evolution of the group. It also represents the first documentation at this site of a genus that was otherwise known only from Texas. Fossil insects preserved as an imprint on laminae have subtle differences in relief which can be difficult to photograph. Recourse to reflectance transformation imaging allowed us to deliver exhaustive and interactive photographic data for Protelytron permianum. Based on these data we were able ascertain that it is an early relative of earwigs. In order to better appreciate its elaborate hind wing folding mechanism, we provide guidelines to build and operate a paper model. Extant beaked whales perform deep dives to forage for squids. We studied the morphology of the fossil ziphiid Messapicetus gregarius to evaluate its ability to perform such dives. Our analysis suggests an enlargement of the pterygoid sinus system in deep divers. In M. gregarius, the pterygoid sinus is enlarged, but other lines of evidence indicate that the coastal environment also represented an important part of its home range.